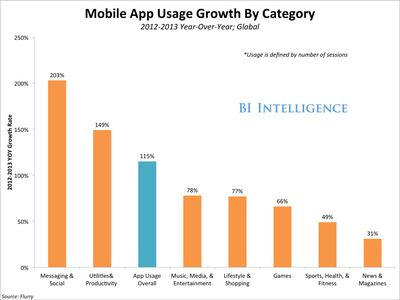 Messaging apps are incredibly popular right now. WhatsApp is the biggest, with over 600 million users, but it’s closely followed by major competitors, including Asia-based WeChat and LINE, and Facebook Messenger. BI Intelligence’s data shows that WeChat, LINE, WhatsApp, and Snapchat are all growing their user numbers in 2014 at a quarterly rate of 15% or higher. But it’s more than just free instant messaging that’s driving the boom. Really, it’s more than even messaging. A new report from BI Intelligence takes a deep dive into the messaging wars, exploring how fast each of the mobile messaging apps are growing, and how many of them are already monetizing their enormous user bases. The report contains our exclusive estimates for monthly active users for all the top global messaging platforms — including some like Snapchat and LINE, which do not release MAU numbers. We describe the similarities and differences between 15 messaging apps, including a case study of Japan-based LINE as an example of how this category can monetise and drive hundreds of millions of dollars in revenue. LINE draws revenue from stickers, in-app game purchases, marketing and ad products, and even retail sales of toys based on its popular characters. With elegant distribution through mobile app stores and a simple foundation around the phone’s address book, it’s relatively easy for new messaging services to sprout and flourish. Social messages are among the rare mobile push notifications that don’t feel spammy and are likely to be among the first read every time they arrive. This is important for impression-based businesses such as advertising. For full access to the report on Social Messaging and all BI Intelligence’s charts and data on the mobile and social industries, sign up for a free trial subscription today.